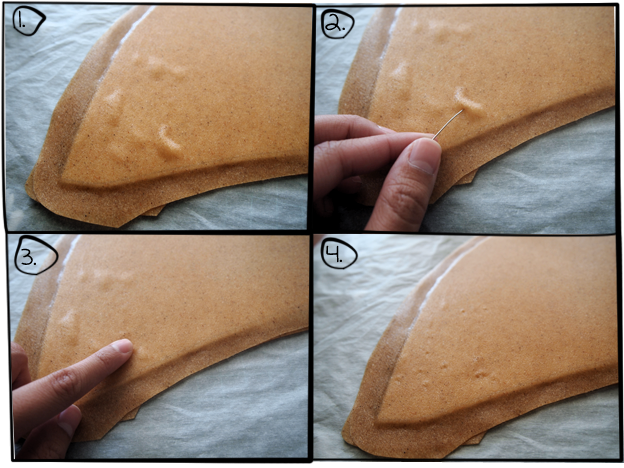 Tiff shared with us this great way of dealing with the air bubbles you get from sandwiching Worbla. If I had a dime for every air bubble I made using the Worbla and craft foam sandwich method, I’d be retired by now. Worbla is a wonderful material to work with, but it’s so easy to form air bubbles even when you think you’re being really careful. Have no fear, there’s a really simple way to get rid of it by using just a needle! Make sure to use a heat gun to warm the air bubbles so it’s nice and soft. While it’s malleable, use a needle to poke a single hole in the annoying air bubble. You must poke it at an angle (see picture #2) so it can open the hole. Poking straight down wouldn’t be as effective I’ve noticed. After poking the hole, use your finger to pat it down so the air gets released. It should be a lot smoother and less bumpy. Sure, you can see subtle holes on the surface but it’ll disappear when you fill it with gesso or wood glue. Thanks again to Tiff for sharing with us. Check out her tutorial on folding Worbla as an alternative to sandwiching it.